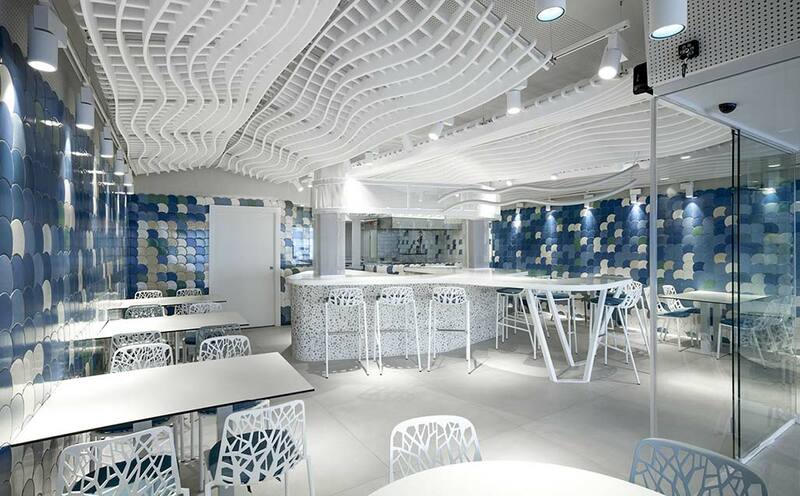 Located on the beachfront of El Campello, Alicante, Spain, is the Drassana MedBar restaurant, designed by Escalar, an establishment where the bar made with the solid surface from PORCELANOSA Group, KRION, takes prominence, coordinating and organising the restaurant. Its original design facilitates the work of waiters, and frames the arrival and departure of their clients. The Escalar - LAboratory of RAdiCAL ARchitecturES studio plans solutions for all types of architecture, landscape, urban development and design projects in locations around the world. They told us why they selected KRION lux1100 Snow White for the bar of this vibrant establishment:. “KRION was selected as it allows an individual piece to be created, customised and adapted to the organic geometry of the design. Its antibacterial properties, and lightness, resistance, durability and easy-cleaning, along with a pure white which reflects colours and lights, allow it to be prominent in the user experience, strengthening the identity of the project”.